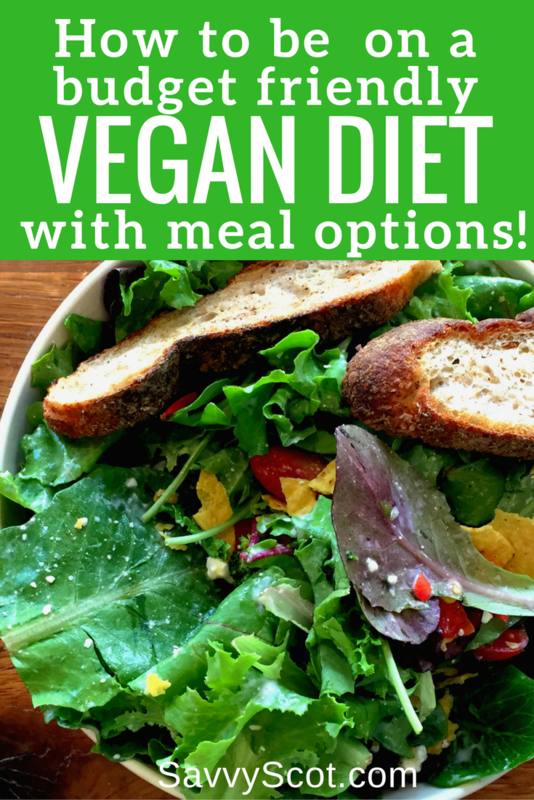 How to be on a budget friendly vegan diet with meal options! January 1, 2017 rolled in and you decided to eat healthier. Specifically you’ve decided to go vegan and eat an all plant based diet. You’re excited! You do research, you find recipes and watch tons of Youtubers video blog about what they eat in a day. You then rush to the grocery store and discover the prices of the all plant based, all organic food and your like WTF! Don’t panic, or stop if you already are panicking. Purchasing food for a vegan diet should not cost an arm and a leg and does not have to. There are some simple tips to follow to keep a vegan diet budget very close, if not less, than your food budget before going vegan. Below are the four steps to incorporate into your new vegan diet to be successful and not break the bank. Developing your vegan meal plan and a grocery list is one major way to stay within your budget. The meal plan will prevent you from going into the grocery store and adding foods or items that you do not need, essentially draining your budget. I suggest developing a meal plan around your pay periods. For example, I get paid bi-monthly (15th and last working day of month) therefor my meal plan consist of about 15 days of meals between pay periods. Does this mean I’m planning and preparing 15 separate meals? Absolutely not! You could if you like to! I actually prepare 2-3 meals per week that I alternate and a snack. That totals about 4-5 meals for a two week period. Avoid making fruit and vegetable purchases that are out of season to stay within you vegan diet grocery budget. In season fruits and vegetables can make a $.50 to $2.00 difference. For example, in summer sweet potatoes average about $.78-$1.00, however around October until about January sweet potatoes are usually anywhere from $.24-$.58 a piece. Farmer’s Markets usually have the best selection of in season fruits and vegetables at reasonable prices. Also, some market chains such as Aldi’s and Fresh Market are reputable for its amazingly fresh and reasonably priced produce. Frozen fruits and vegetable are a good alternative to incorporate for staying within your vegan diet budget. Frozen fruit for smoothies or smoothie bowls are much more inexpensive than a combination of fresh fruit for smoothies. There are also options for “fresh frozen” which means that the fruit was picked “fresh” then frozen. So, you pay about half the cost for someone to have picked the fruit or vegetables for you, package, and freeze it. Sounds like a win-win to me! I can not emphasize enough, how important it is to have a plan and a list to ensure that you stay within a budget while shopping, or at least keep cost low if there is not a specific food budget amount. The other essential is to purchase just enough to get you to your next trip. This promotes success because you only have those fruits and vegetables to eat. Additionally, you should become more disciplined or creative depending on your personality! If you find that you have an excess, freeze it! The ability to further preserve fruits and vegetables for later use is an added bonus for vegans! Frozen fruits and vegetables can last weeks in the freezer and its as simple as placing the bag or container on the counter to defrost and prepare. I usually freeze all my access fruits and use later for smoothies, smoothie bowls, and ice cream. Vegetables I like to freeze are squash, zucchini, onions, and peppers for soups. However, any vegetable that you can purchase frozen and prepackaged can be frozen fresh from your kitchen as well. In case you are still panicking about your newly Vegan diet, below are some simple meals under $10.00! Prepare spanish rice and black beans according to the preparation instructions. Add avocado to desired consistency, season, and eat with tortilla chips. Slice spaghetti squash in half, scrape out seeds and season to taste. Place the spaghetti squash upside down on a cooking rack and cook for about 30 minutes. On top of the stove in a frying pan, sauté mushrooms in olive oil with garlic until slightly darkened. Once spaghetti is done cooking, scrape the sides to produce what should look like spaghetti noodle. Add mushrooms, garlic and diced tomatoes. Garnish with fresh basil. Sauté mushrooms in a pan with olive oil and garlic until garlic is translucent and mushrooms appear a grayish color. Brush one side of naan bread with olive oil and place that side directly on the oven rack. Place sautéed mushrooms and tomato slices onto the naan bread and season with fresh basil. Let cook until desired crust. Defrost and drain bag of frozen fruit on paper towels. Then place the vegetables into a mixing bowl, oil with favorite oil, I prefer grape seed, and season. Place on a single layer and broil on low for about 20-30 minutes depending on your desire crunchiness. The above information should better prepare you for your vegan journey! There is an abundance of options to incorporate into your vegan diet. I’m a strong believer that vegan’s can enjoy most foods as people on a meat based diet only healthier! Hi! I’m Shirria, wife, mother of five, full time Social Worker, and now blogger at Goal Digging to Happiness! I enjoy spending time with my family, reading, and jogging. I have recently discovered a new interest in baking, but we’ll see how long that last. Like and follow Goal Digging to Happiness on Facebook, and Twitter @Diggingtohappy!